You have a party, shower, rehearsal dinner, or reception to pull together and are not exactly sure how to create a cohesive theme? The book Decorate for a Party by Holly Becker and Leslie Shewring can help. Here I take you through how the authors delve into 10 distinct looks, plus show you examples from the book. Note: I received a free review copy of the book from the publisher, Jacqui Small LLP, in exchange for a review (good or bad). I got no money to write this post, nor do I receive a commission if you purchase. This book is chock full of photos. At first, I found it old school to look at pictures in a book instead of on Pinterest. But I quickly found the difference: the book shows exactly how to create cohesion whereas clicking around online shows you one-offs with no clear path to melding your projects into a unified look. The authors provide that path by walking you through 10 themes, one per chapter, and specifically explaining how they accomplished each. Their approach is about making the most of what you have and adding a creative twist. The result is easy projects that come together in an elegant way, leaving time for joy- and love-filled celebrations. Each theme begins with an overview of suggested seasons and types of parties; colors and patterns; specific elements they used to create the look; and a suggested music playlist, followed by a photo of the overall look. Next, they break it down, explaining how to create each item. All are easily achievable, but the most complex project in each chapter is accompanied by a simple, step-by-step DIY. My favorite sections are the “6 Ways” demonstrations. Who hasn’t run across a project image you like in general, but there’s something not quite to your taste? Here, the authors take you through different approaches to creating the same similar look. They address stamping napkins, putting together place settings, creative wrapping, napkin rings, name cards, drink stirrers, chair backs, goody bags, food to go, party hats, and balloon décor. The six approaches to drink stirrers, for example, are: use mint as a skewer and thread on berries; tie a lollipop stick with ribbon; attach a paper flag to the stirrer and write a one-word message; thread edible fruit onto a skewer; decorate the stirrer with beads and a heart; and attach a gumball to the end as a decorative handle of sorts. There is a photo of each so you can explicitly see the different vibe each gives off and easily choose your favorite variation. The book is a quick read, chock full of photos. The text is to-the-point without a wasted word (which I love) and a focus on help. Holly and Leslie explain how they accomplished each element, plus share related advice. I would definitely recommend it to anyone looking for ideas on how to pull together a specific event theme. 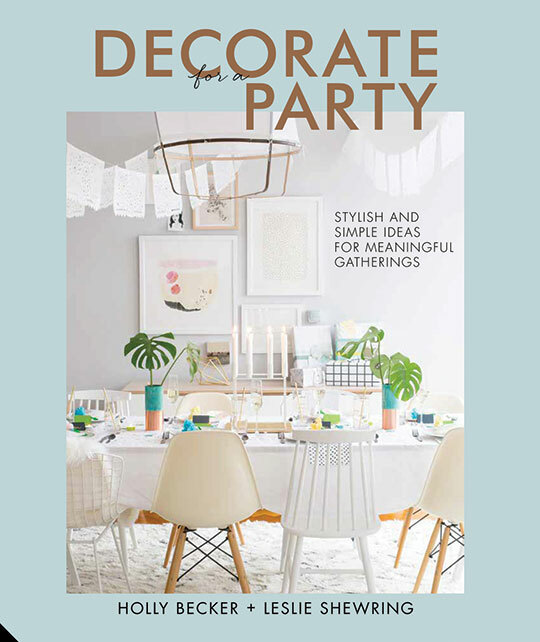 Decorate for a Party by Holly Becker and Leslie Shewring is available on Amazon in hardcover and for Kindle. Post Title Image: Holly Marder, avenuelifestyle.com (marshmallow skewers); Janis Nicolay, janisnicolay.com (calligraphy candles and wrapped vase); and Leslie Shewring, leslieshewring.com (forest cake).